Seun Fakuade is one of those young Nigerian thinkers that helps retain the faith I have in Nigeria when I left for Europe almost a quarter of a Century ago. I have watched how he has striven and struggled to make sense of the malaise that afflicts Nigeria and how he with like-minded people have joined up leveraging tools at their disposal to seek out solutions to its many problems. There are people in Nigeria who have a higher calling beyond the corrupt and unconscionable kakistocracy of the ruling class that seems to have a vice-grip on the neck of Nigeria and I count Seun as one of such Nigerians. His contribution to my #YourBlogOnMyBlog Series commemorating my Decade of Blogging closes 5 weeks of interesting insight from 35 remarkable people but opens up many questions about Nigeria’s future. Whilst this is a long read, it is an essential and critical read too, it is about education in Nigeria, from the products entering the job market with literally no marketable skills, or even suffering from the consequences of strikes as explained by Chuba Ezekwesili’s contribution to this series to the powder-keg of over 10 million out of school children. No matter what the government parrots bandy about as statistics and gains, this is a disgrace and an emergency that has been put in the hands of garrulous political jobber – Nyesom Wike, the Minister of Education. His profile shows he has no pedigree or antecedents that qualify him for such a critical task, however, I must not write Seun’s blog. 10 years. Wow. That is how long Akin has been blogging. When Akin writes, he leaves you with impressions: his literary expressions leave you awed at the vocabularies, his grammatical constructs and oft time – more confused while trying to make sense of all. In all, you just have to like him. Self-deprecating, mingling, a definite sense of dignity, and all an understanding that one must follow before he leads. Akin is over 40, yet considers some of us decades before him as his comrades. That is humility if you ask me. Seeing that he has kept on blogging for 10 years is a jolt for me to take time away and resume blogging. Egbon Akin, as I fondly refer to him, left me awed the first time we spoke on the phone: baritone voice, but with unmistaken command of the English letter, and an astounding grasp of issues. He called shortly after the #occupynigeria protest – one which had left most of us angry, irritated, confused, and even disappointed. After about 20 minutes, his compelling soothing words left me better than I initially was. Nigeria is blessed with many men like Akin. One of such is Ade. He had picked me up twice at the airport: well built, soft-spoken, well mannered, and with a demeanor that shows refinement in all measures. I am quite observant, so the third time he picked me up, I was curious enough to ask him why he was a taxi driver despite his impeccable command of English. Ade confirmed what I had suspected: he was a graduate who resorted to driving to make ends meet after three years of futile search. Since that day, I developed a more empathetic affection for him and I have always utilized his services anytime I don’t have family to pick me up. Ade, like many other jobless graduates, exists in many localities across states in Nigeria. 10 years. Long enough to juxtapose where we were in 1999 and where we are now. Long enough to ask “are we better off”? 10 years; enough to cast reflections on Nigeria and its myriad problems. 10 years, with the same challenges and new ones; with the same unsolved national problems despite monies spent. 10 years is enough to reflect on Nigeria’s torturous path to redemption, to escape from oblivion; enough time to find out if Nigeria’s democracy is worth it in the first instance. 10 years is more than enough to weigh our options; to consider as citizens what we must do if Nigeria as a nation must advance in growth and development; not just throwing around numbers and digits as measures of growth. 10 years. Sufficient time for me to see the widening disparity between the rich and poor, to see the growing unrest amongst the youthful population, to see children hawk more in growing numbers on our expressways, to see that nothing significant has changed regardless of the deceptive words thrown around by sycophants and growth propagandists – if you may. 10 years. Enough time to see Nigeria plunge from a steady and gradual path to redemption back to years of impunity and government-backed or sponsored corruption. 10 years has enabled us see politicians make promises that they won’t keep; seen years of waste in almost every sector of the Nigerian state. Yew’s administration sustained an investment in the education of its young people, ensuring that the best and brightest of its citizens are sent to the world’s Ivy League schools each year; and re-absorbed into the country’s leadership (public offices) to steer change and utilize their human capital as fit. Contrast that with Nigeria where public leaders are less interested in the future of the nation (as actions imply); less concerned about investment in education; and the education sector is riddled with years of cyclical union unrest (the University Union – ASUU – last week ended another 5 months strike that has become typical of administrations in Nigeria); rote learning, reductive and outdated curriculum and unmotivated tutors/teachers. The hope for Nigeria lies in its young: the impressionable, malleable and bubbling population; as such, a clearly-focused leadership needs to pay due attention to building its capital through a rigorously policy-driven investment in world class education that will solve its present and future challenges. The capital investments in the past 5 years in education, have they been driven by sound accurate data that reflects what priorities and focus should be? Skills mismatch contributes, in part, to the ridiculously high unemployment rates in Nigeria amongst young people: young ones are either studying what is not specific or tailored to their career path, or being taught by outdated methods/techniques in over-crowded classrooms; leaders are barely interested in sound solutions than they are in the transactional contracts in education; and unfortunately, citizens are rarely interested in the process so long as they obtain a certificate. Every quarter, the National Youth Service Corps churns out about 72,000 new graduates (2,000 per state): half-baked, ill-equipped to contribute “meaningfully” to the economy or innovatively create jobs themselves as entrepreneurs! Science and technological advancements in nations are brought about by innovations and entrepreneurial creativity driven by citizens/private sector; based on a solidly sound foundational cutting edge education. The lopsided policies, distorted leadership and unpatriotic greedy characters in Nigeria’s political leadership give no room for arresting Nigeria’s educational backlog of problems. The statistics weigh against a bright future. Despite the 8% capital investment in the education sector (a shortcoming of UNESCO’s recommended 26%), it seems Nigeria is making no in-roads to solving most of its pressing challenges. The out-of-school tragedy in Nigeria validates my unsettling worries. Aggressive investment in education backed by thorough sound policies has resulted in marked reduction in arresting the trend of out-of-school children across other regions and in other countries; seen remarkably in India and Ethiopia. Why, in contrast, has Nigeria’s case being different? 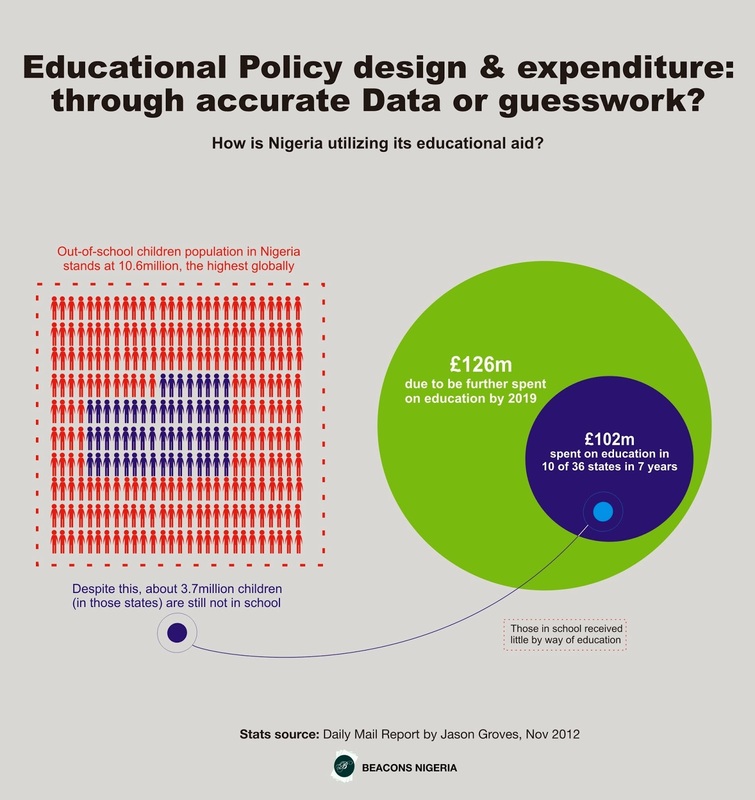 Who enacts educational policy in Nigeria? What data do they draw in from policy decisions? The 10.6 million out-of-school children [PDF] population in Nigeria is highest in the world - the exact size of Tunisia as a nation, twice the size of Singapore as a nation. The socio-economic implications of these children in the next 10 years should be a great source of concern for all Nigerians. If resolved, viable individuals can transform the economy of Nigeria in no small measure, contribute meaningfully to their families and live a sustained vibrant community. If unresolved, high unemployment will result in more crimes, violence and terror cells to mention a few. Foreign aid in education has resulted in little or no progress as desired. If policies are meant to determine the appropriate investment, what specific data has education public servants been using to deduce their policies? It behooves on every patriotic citizen to call leaders to wake to the tragedy ahead. It is important that anyone who has the ears of decision-makers in education call them to the ticking time bomb the neglect in education will cause. A nation with viable human capital has many advantages socially, economically and politically. Capital must be emphasized on, not only during political campaigns or with speeches and beautiful rhetoric but backed with accurate data alongside aggressive and measured actions. The leadership in Nigeria in the next 10 years has an unenviable job of fixing the rot, the problems and averting impending tragedies of the future. The next 10 years will depend on active citizens who will make constant demands, participate and engage in the democratic process. Corruption thrives in an environment riddled with unaccountable leadership. An awakened and participatory citizenry is a guaranteed check for corrupt leadership. To this end, it is essential that citizen voices are not silenced by any means, through legislative censure or otherwise. Censorship of dissenting but critical citizen voices is inimical to democratic growth. This is why the proposed intelligence surveillance on Nigerians by the Goodluck Jonathan administration is a threat to the expression of critical voices against all forms of corruption and impunity. Nigeria has all the best human and natural resources needed to be the greatest country in the world IF the best and brightest people lead. Will the best and brightest citizens rise or whine? Truly, is there hope for true transformational growth and quantifiable development for the next 10 years?